Posted on June 10, 2007 June 11, 2007 by Debito Arudou Ph.D.
STOP THEM AT THE SHORES, PROTECT [OUR COUNTRY]. PLEASE COOPERATE IN STOPPING ILLEGAL ALIENS AND THEIR ILLEGAL ENTRY. Nothing like six riot police (seven, actually–look closely) in full regalia to protect us from the alien horde. Er, can horde be singular? Anyway, yet another example of overreaction and targeting by the government towards NJ. Sure, raise awareness about overstayers and illegal entrants. But don’t make it seem as though there’s an invasion afoot, and that you need measures this extreme. 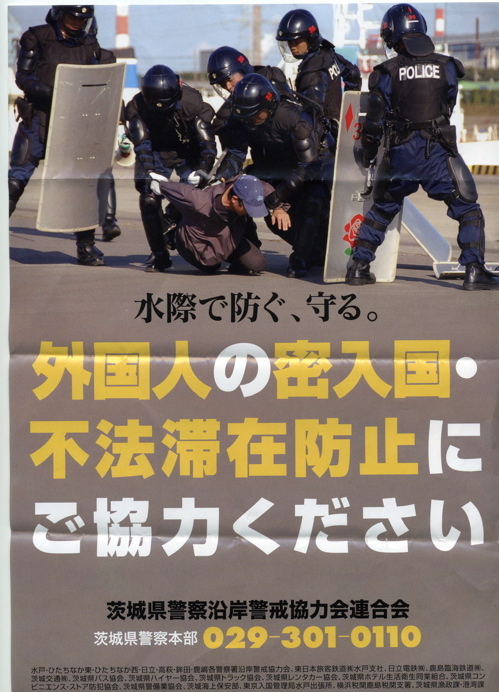 It’s a good thing they had on their heavy riot gear…who knows what those scary foreigner criminals are capable of! Actually there’s seven! One is running in from the right hand side behind the one in the foreground. That guy must be more dangerous than we thought! I wonder if there’s an equivalent poster in the US regarding the Mexican border. If there was such a poster, the illegal immigrant activists will go insane with rage, and the makers of the poster will be forced to say sorry. Such is the “American Way”. Amazing. If this type of ad, especially from a government agency, was shown in the United States, there would be mass protests for such a racist and fear mongering announcement. It would never happen in America except maybe from some right-wing political organization. Does anyone know if any formal complaints regarding this poster have been lodged? This poster is absurd and is the worst possible taste. I’m tempted to give the Ibaraki Prefectural Police Coast Guard Cooperative Union a piece of my mind. I’m definitely going to be careful if I ever go near a port or a beach up in Ibaraki. Hmmm. Well, there are two ways of looking at this photo. One, it’s a realistic depiction of how Japanese police handle an illegal immigrant. Two, it’s been wildly exaggerated for dramatic impact: a photo of a lone officer quizzing an immigrant in a stark room would not be nearly as eye-catching. The ‘cooperation’ required is presumably that of not employing illegals, as Japanese citizens certainly do not have the power to question and detain suspected illegals – in fact they do not even have the legal right to ask for your alien card. Sometimes I wonder what Japan’s official policies towards immigration/aliens would be like if they weren’t right next door to North Korea and even perhaps China (or got on far better with China). The presence in Japan of thousands of North Koreans is a particular issue, as can be seen with this recent scandal about the ‘sale’ of the Choren HQ to a former head of the National Security Agency. That’s shocking! I visited Ibaraki-ken last summer: what an enjoyable and peacefull area. Still, every now and then these radical right wing black busses with their loud speakers drowe by and destroyed the scenery. There’s still a lot of prejudicious people in Japan tinking the way they thought in the time of the Second World War. It’s sad, and this picture makes me sad.